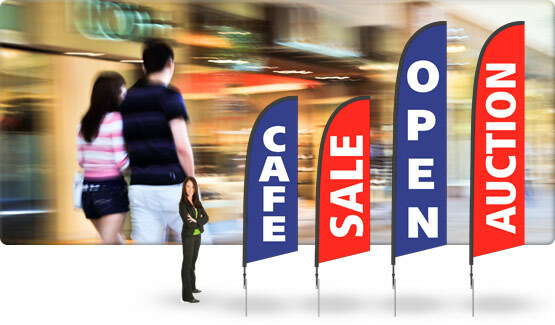 Promo-blade printed fabric flags are an extremely cost effective way to promote your business and draw in more customers. These printed flags are a stylish aerodynamic shaped banner with a large print area for your message. A composite fibre pole supports the top curve to hold the shape allowing the lower half to move in the wind to attract attention! Promo-blade banners consist of a simple white text design with a solid screen-printed background colour of your choice. Choose from our catalogue of designs or customise your wording - all at the same affordable price. Promo banners are extremely versatile, waterproof, durable and easy to transport and can be used outdoors or indoors. You choose a colour background. Choose from our catalogue or customise your text. We use quality fabrics proven to last outdoors. Our standard fabric is a New Zealand made polyknit fabric which is strong and durable. Promo-blade banners are light-weight and can be assembled in seconds with a range of mounting options. Printed Fabric Banners are surprisingly light weight and easily pack down into an optional convenient carry bag for easy transportation. Perfect for trade shows, field days, sporting events, corporate events.